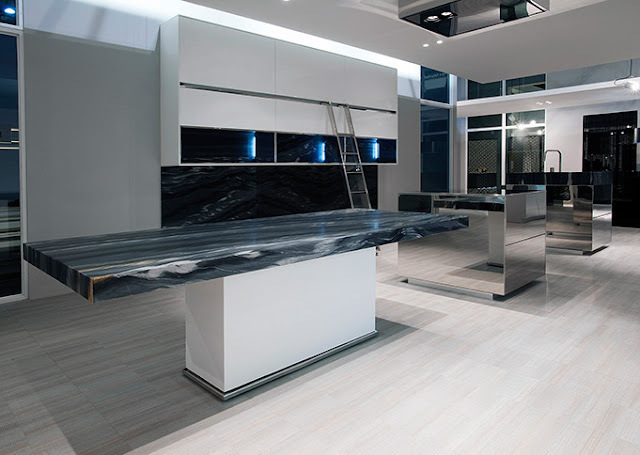 The Mogul has long argued that the modern kitchen can now be defined by its island, with the taller more cumbersome elements being absorbed by the surrounding architecture or being cloaked behind transforming cabinetry. 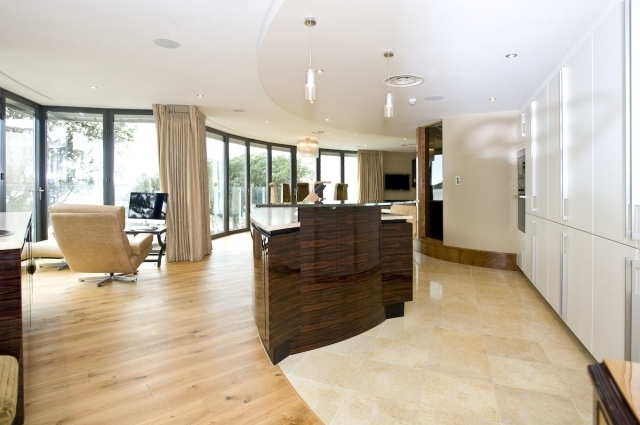 The kitchen is in-fact an island with some modified architectural cabinetry in support. 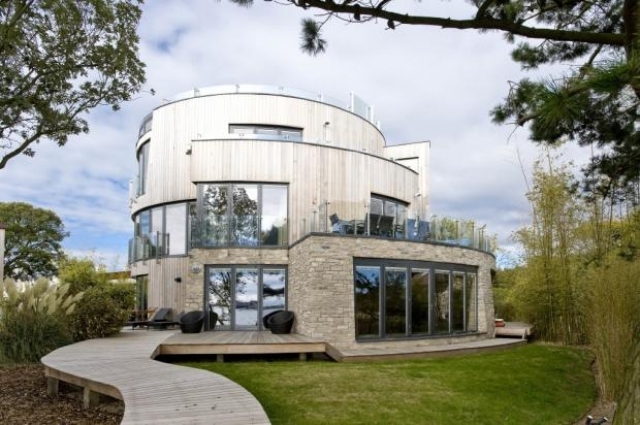 So it is interesting to see how this design and an increasing number of others are detaching the island from the floor, creating a floating centrepiece which is only tethered to the architecture by the services required for function. 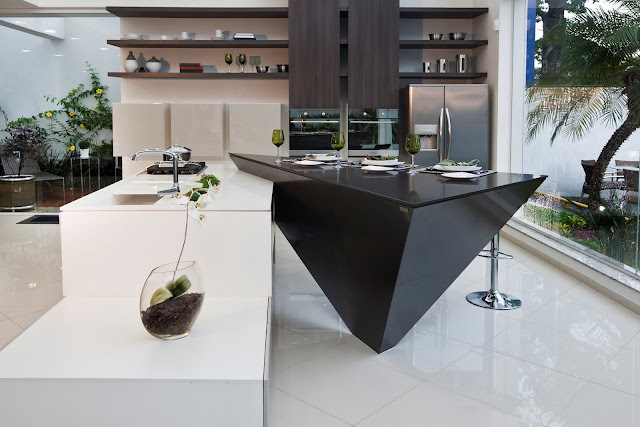 This design accepts that there must be unity between kitchen and architecture but it also expresses an understanding that there must be a connection with the other pieces of furniture sharing an open plan space. 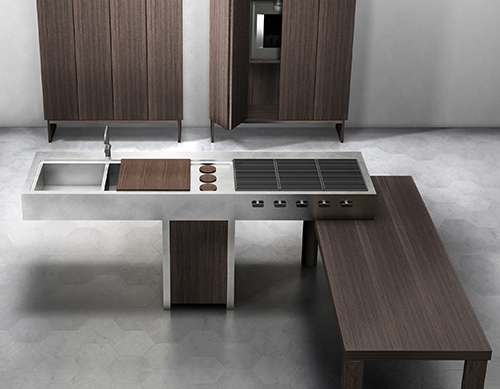 The T-shaped island unit is like a functional docking station, able and willing to accept elements that can temporarily enhance the functional experience without permanently polluting the aesthetic influence of the kitchen. Welcome to a new beginning! 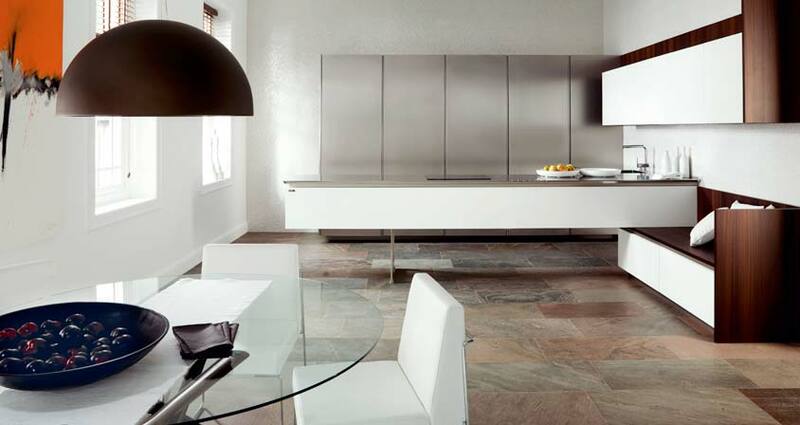 Transforming furniture absorbing kitchens are here! There are some interesting features in this design. Immediately the eye is drawn to an impressive cantilever which extends endlessly across the room only defying gravity by leaning subtlety on a supportive crutch. This zero gravity feature of fantasy has also been given a shoulder to cry on, a functional support which is designed to take the weight off the burdens that everyday life can throw at us. The low level storage area which supports the end of the cantilever has been given an extended gable that transforms it into a cosy snug, perfect for casual entertaining. The wall units mirror this feature by including a high level shelf which meets an extended gable end. 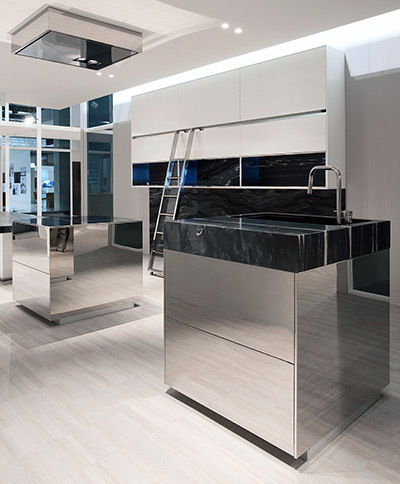 These features are impressive allowing this kitchen to traverse the void between kitchen and living space but do these elements dilute the functional capacity of the kitchen. Is it possible that potential storage space has been replaced by fresh air and that the high and low level cabinetry has become guarded by an impassable cantilevered border? 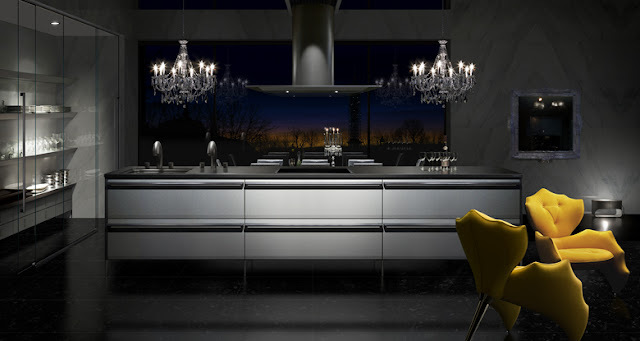 Kitchen design is a highly personal mix of eclectic style, functional performance and fashion; it is the designer’s duty to empathetically translate the personal priorities of each individual client! 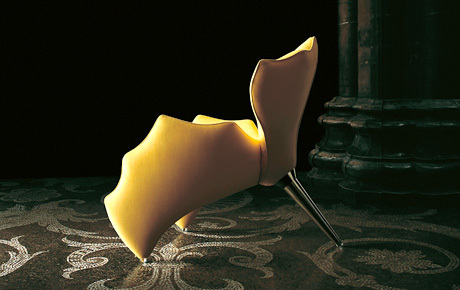 It is interesting to see how this contemporary design has been softened by introducing more approachable geometry. The underside of the impressive cooking zone displays the aerodynamic qualities of an aircraft wing and could even be likened to the hull of a sea fairing vessel which uses smooth and gradual geometry to cut though the ocean more efficiently. 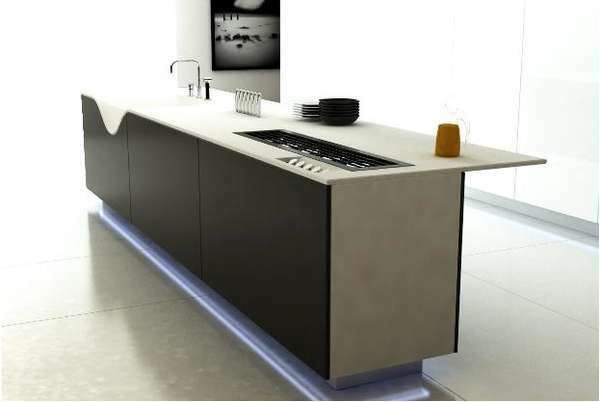 But having the hard edges removed may not only have aesthetical advantages, as cantilevers and breakfast bar areas are notorious hazards for small children who can be unfortunate enough to occasionally pay a painful price for their parents pleasure of owning a designer kitchen. The breakfast bar of this design also appears to be counter balanced across the lover storage area so it may have been possible to create a fantastic free floating cantilever that could swivel between states of use, rotating 90degrees and resting upon the lower storage area when in a standby position and leaving the living area free from physical obstruction. 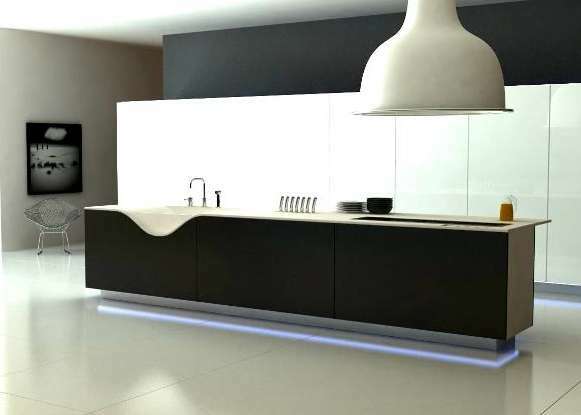 Doing this would not only allow this kitchen to become a dramatic shape shifter but it may also reduce the amount of occasions when small heads make contact with hard objects. This is a powerful image displaying all of the serious style contradictions required to create the perfect modern kitchen. 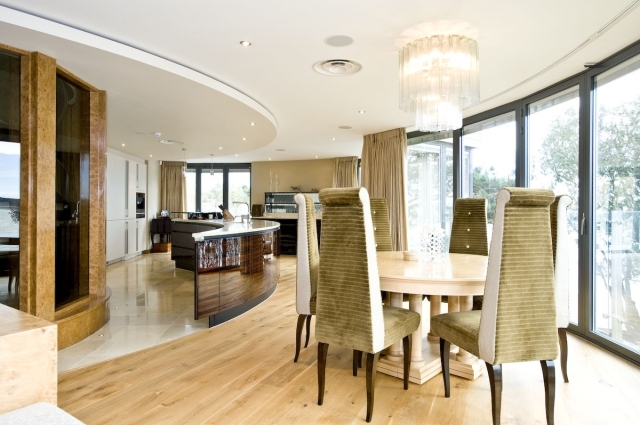 Contemporary styling has been perfectly counter balanced by the inclusion of some fantastic classical features. 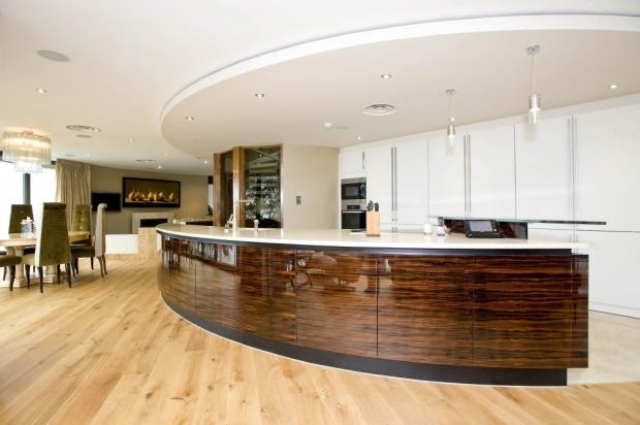 The kitchen has become a vortex of style with the ability to fuse polar design elements. The newly empowered kitchen has become a source of inspiration, an epicentre of artistic and personal stimulation, amalgamating conflicting ideas and styles in a new and positive way. Love this one! The seating is fabulous! Reflective surfaces cause unavoidable introspective contemplation. With this design there should be no regrets! 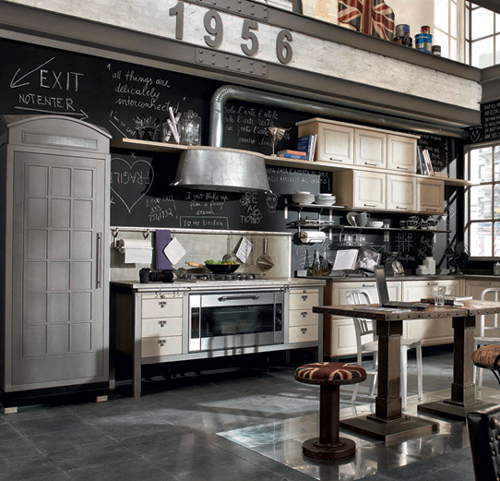 The kitchen is a time capsule, a piece of functional furniture which can become an emotional trigger for our senses, encouraging us to relive our childhood memories and reminisce about people and friends who are no longer with us. 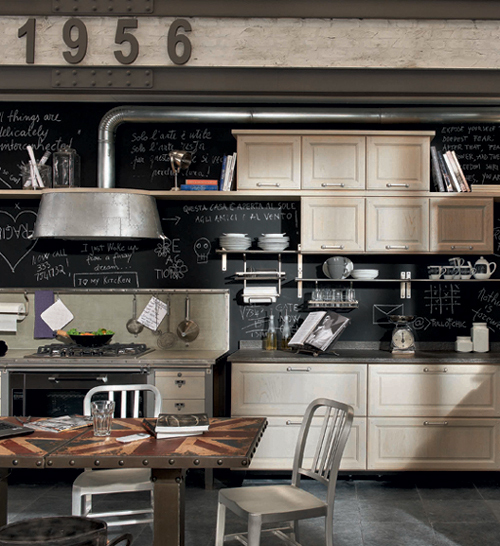 It seems appropriate therefore that the adeptly named 1956 kitchen presents a very nostalgic approach to kitchen design. The design embraces some very innocent looking features that could be perceived as being potentially un-commercial in the refined mainstream market. This kitchen is certainly quirky, with a homemade look, but it is also very different, allowing itself to be openly influenced by nostalgia and embracing the simpler materials and textures of yester year. Are we now going to see the development of an economic and socially influenced trend where mainstream style becomes perceived as being vulgar and kitchen design becomes influenced by re-runs of “The good life”! But no matter how much this design looks over its shoulder and into the past it cannot escape some contemporary classifications. There is some serious asymmetrical styling within the design and a blatant disregard for convention; and it is this confident disrespect for the new and the now which makes this design embody itself as art. Love the telephone booth fridge housing! Nature is an inspiration, an awe inspiring portfolio of design perfection which can exude a quiet influence over the refined disciplines of architecture, fashion and interior design. Powerful natural elements like wind and water can inspire designers to express themselves in an exceptional way, reaching beyond the norm and delivering something which can enrich the senses. 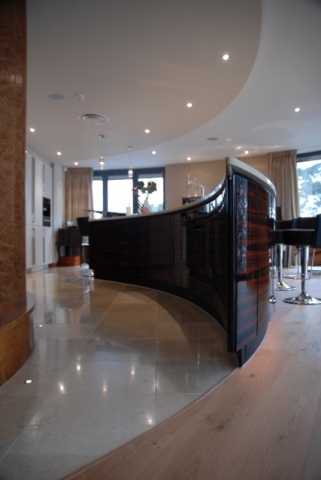 The extended curve of this island design exudes the flexibility of canvas which arcs and moves with the wind. The inviting and sensually smooth ebony curve reaches a refined climax by cutting though inherited design perceptions like a bow though the waves. There is real beauty in this design and an understated appreciation of feminine charm! The Mogul loves this one. 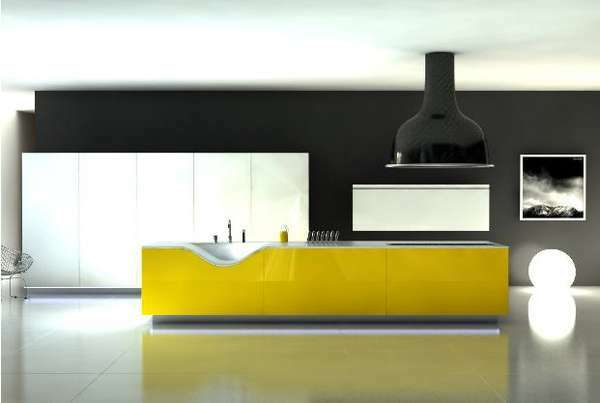 The Mogul has always stated that kitchen design can be expressed though an artistic play with functional shapes, but here we see this belief taken literally. The design has a layered and asymmetrical appearance and the mix of textures and materials works really well. High level open shelves provide a blank canvas for the personalisation of this design with their high level placement allowing the functional hot zone to become unpolluted with personal artefacts. 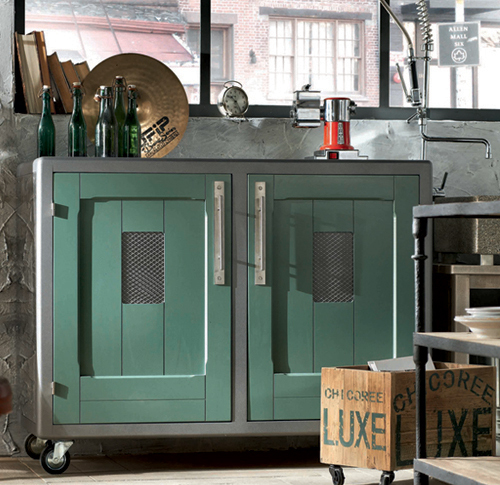 The introduction of extra tall oven housings provides a connection between the open shelves and the functional elements within the design. Breaking the shelves in this way also emphasises the asymmetrical styling and quietly expresses this kitchens functional dominance which supersedes aesthetical and personal dressing. The design reaches beyond the norm by introducing a unique visual hook, a breakfast bar that plays tricks with your eyes and prompts you to ask the questions; how? Why? And where can I get one!